High Impedance Headphones? They’re In The Can! [George Trimble] likes to build crystal radios. The original crystal radio builders used high impedance headphones. In modern builds, you are as likely to include a powered amplifier to drive a speaker or normal headphones (which are usually around 4 to 16 ohms). [George] builds his own speakers using chile cans, some wire, a few magnets, part of a Pepsi can (we are pretty sure someone will leave a comment that Coke cans sound better), and the iron core out of an audio transformer. You can see a very detailed video of the process, below. There is a little woodworking and hot gluing involved. The result is decidedly homemade looking, but if you want to say you built it yourself (or, if you are a prepper trying to get ready to rebuild after the apocalypse and you can’t find a cache of headphones) this might be just the ticket. 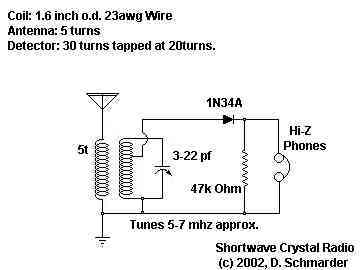 When you think of a crystal radio, you probably think of something simple maybe built out of household scraps. Not if you are [Chris Wendling]. He recently posted a video (see below) of his high-performance crystal set. He doesn’t take any shortcuts: he has several hundred feet of antenna wire, and uses a cold-water pipe ground system. With no amplifier, a strong signal input is crucial. The radio has four subsystems: an antenna tuner, a bandpass filter, a detector, and a powered audio output system. He also has a truly enormous system of speakers on the ceiling–this isn’t the crystal radio you made in the boy scouts.